In addition to the $40,000 winner’s check (same as Chepkirui in the women’s race), Kiprotich will take home $10,000 in time bonus incentives. HONOLULU (15 Dec)–As fireworks lit up the Hawaiian sky at Ala Moana Beach Park, Joyce Chepkirui got off to a blazing start. Leaving the pacemaker in their wake, Kenyans Chepkirui, Isabella Ochichi, and Lucy Karimi would roll through Waikiki well under course record pace, splitting an improbable 33:21 at 10-K. Chepkirui thought a fast early tempo would play to her advantage.Just before halfway, Chepkirui took the lead and slightly gapped her compatriots Ochichi and Karimi. Splitting the half-marathon in an eye-popping 1:11:43 –believed to be the fastest half-way split in race history– Chepkirui was clicking off miles like a metronome. If she could keep this pace up, she would finish minutes under Lyubov Denisova’s event record of 2:27:19.However, just like last year, the second half would slowly but surely catch up to Chepkirui. In the 18th mile (29th kilometer) Karimi and Ochichi came up on her shoulder, drawing even with the defending champion.Overcoming the building fatigue, Chepkirui relied on sheer determination to complete the final miles: clear on her mind was her late manager Zane Branson, who passed away suddenly this past July at the age of 57. He was one of the first people to congratulate her after last year’s victory.“I loved Zane, and Zane was like a brother,” said Chepkirui, who also won the Amsterdam Marathon last October. When asked if she dedicated today’s race to him, she responded with a firm, “Yes!”Powering down Diamond Head Road with less than a mile remaining, Chepkirui broke away for good. She’d cross the finish first in 2:28:34 after running second half in a gritty 1:16:51.“I won again and I feel happy. This was a great win today,” said Chepkirui, a medal and flower lei resting on her neck. “It was my plan, because on Wednesday I said I want to run 2:28 and I made it. I am so happy.”Karimi finished second in 2:28:55, with Ochichi rounding out the top three in 2:29:44. The day, however, belonged to Chepkirui. “By God’s will I’d like to come back again next year!” she said. (c) Race Results Weekly, all rights reserved HONOLULU (14-Dec) –Chebet, 29, played the waiting game here today to perfection. With a steady rain falling at the start and high winds expected, Chebet made the conscious decision to tuck into a large pack along with Kenyan compatriots Paul Lonyangata and Joel Kimurer, as well as Ethiopians Gebretsadik Abraha and Yemane Adhane, among others. Chebet would not touch the lead until fewer than five kilometers remained.Through 14 miles, it was Japan’s Saeki Makino out front, a training partner of Japanese marathon star Yuki Kawauchi. After a 4:54 opening mile, Makino ran through Waikiki all alone, rattling off mile after mile while a group of seven –including Chebet– established themselves more than 100 meters behind. After cresting the Diamond Head Avenue hill for the first time, Makino’s lead grew to roughly 45 seconds. That’s when the chase pack began to chip away bit by bit.Reaching halfway in a pedestrian 1:08:45, the chase group began pushing led by pacesetter Kimurer. In addition to Kimurer, Chebet, Abraha, Adhane, Lonyangata, Kenyans Nicholas Chelimo and Benjamin Kolum made up the group of seven. With a heavy rain picking up and winds gusting, the group of seven clenched their teeth and passed Makino just before 15 miles.Staying compact, the leaders ran in unison. When one went for water, all went for water. When one grimaced as the wind howled, all grimaced, a matching determined look on all faces. Eyes were focused on the road ahead, deep in concentration.Cheered on by slower runners going in the opposite direction, Chebet, Lonyangata, and Abraha ran towards the front of the pack. Looking at one another, no one wanted to test the waters and surge. The anxiety was visible as the group passed 20 miles.On a downhill stretch adjacent to Waialae Country Club at 22 miles, Lonyangata had had enough. Surging, the 21-year-old injected a burst that was only matched by Chebet and Abraha. The rest of the pack was left behind, unable to respond to the abrupt move.“I was trying my best because I could see my colleagues here were very strong. I decided to push and give it a good time to go,” said Lonyangata. “I had to go.”While Lonyangata’s move was strong, Chebet’s subsequent surge turned out to be lethal. Hitting the base of Diamond Head for the race’s final climb, Chebet dropped the hammer. Within seconds he was all by himself, the $40,000 first- place prize on his mind.“I was trying my best but the time I went I thought my body was responding well,” described Chebet. “I waited all the way through because I knew that these conditions, for me, weren’t good and tough.”Thousands of fellow marathoners cheering on his right, the Pacific Ocean’s waves cresting on his left, Chebet came down Diamond Head Road and entered Kapiolani Park with a lock on the lead. Breaking the tape in 2:15:35, Chebet extended Kenya’s dominance at this race, becoming the country’s 18th men’s champion in the last 19 years. Chebet’s win is made even more impressive considering he had to deal with severe travel difficulties and delays coming from Kenya. Stops at airports in Zurich and San Francisco were extended due to harsh weather conditions. Lonyangata held on for second in 2:16:04, while Abraha took third in 2:16:27. Benjamin Kolum and Yemane Adhane rounded out the top five, finishing in 2:16:37 and 2:17:54, respectively. Kimurer, who was in fourth at 22 miles, did not finish. Also not finishing was last year’s champion Gilbert Chepkwony, dropping off the lead pack within the first 10 kilometers. Winning the masters title was Canadian Olympian and current University of Michigan coach Kevin Sullivan, finishing his debut marathon 2:40:22. He ran part of the course with Olympic silver medalist Nick Willis and American miler Will Leer. FIRST MARATHON WIN FOR JOYCE CHEPKIRUIOn paper Kenya’s Joyce Chepkirui was the women’s favorite entering today’s race, one of the top road racers in the world. She lived up to her billing, breaking the tape in 2:30:23 with a comfortable minute and 12 second margin of victory. It was also a personal best.“I think the race was OK for me. 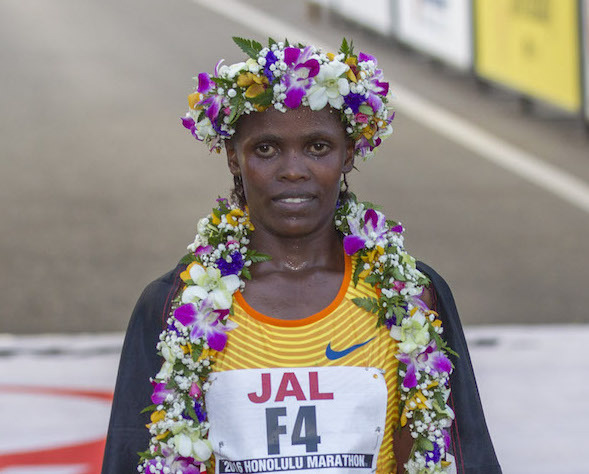 I was prepared for this race, and I thank God I won,” said the quiet Chepkirui, draped in a Kenyan flag and Hawaiian lei.Like in the men’s race, the women’s contest featured a brash early front runner in Sarah Kiptoo. The Kenyan split 34:07 for 10-K well ahead of the designated pace setter and a full 30 seconds up on Chepkirui and fellow Kenyan Isabella Ochichi. Kiptoo would pay for the early pace, surpassed at 8 miles by the pair.Shortly thereafter, Ochichi would fall by the wayside on Diamond Head as Chepkirui kept her foot on the gas pedal. Although no female competitors could keep up with her tempo, Erick Kibet –one of the designated women’s pace setters– stayed by her side. Kibet is Chepkirui’s husband. Together the tandem would split the half marathon in 1:13:07, on pace to break Lyubov Denisova’s course record of 2:27:19. Any bid for a new record was thrown out the window when the winds and rain increased, making the latter miles that much harder for an already fatiguing Chepkirui. When Kibet dropped at 18 miles, Chepkirui had already begun slowing, running miles in the 6:20 range. 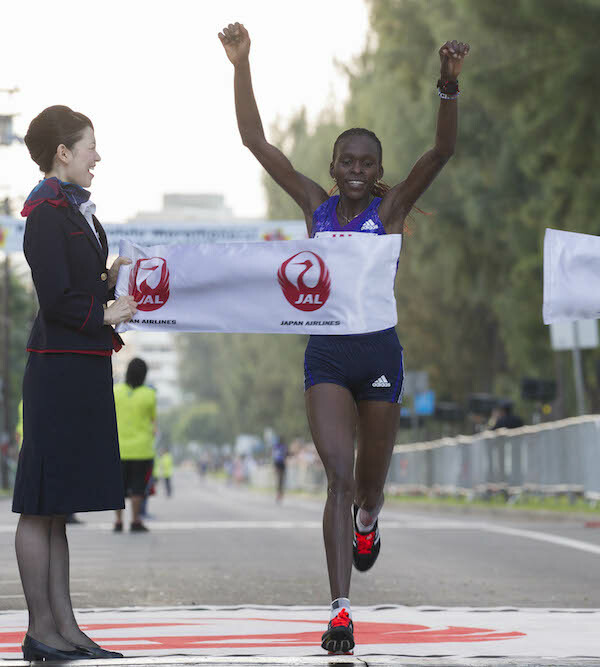 Despite the building pain in her muscles, Chepkirui was able to crest Diamond Head and cruise down the finish straight, breaking the tape held by two Japan Airlines flight attendants. In the process, she becomes the first women’s champion in race history from Kenya. “Yes, I am happy. I think I run my [personal best] here and I thank God. I am so happy,” said Chepkirui. Her previous fastest marathon was a 2:35:54 performance in London last year. Taking second was Croatia’s Lisa Nemec (2:31:35), followed by Ochichi (2:32:22), 2012 Honolulu Marathon champion Valentina Galimova (2:32:26), and Ethiopia’s Woynishet Girma (2:33:20), the 2011 victor. Reigning champion Ehitu Kiros was sixth in 2:36:57, Burundi’s Diane Nukuri seventh in 2:37:11, and early leader Sarah Kiptoo eighth in 2:43:51. Honolulu’s Elizabeth Wong was the first masters finisher, completing the race in 3:17:40. There were 22,068 starters today. The finish line will remain open until the last finisher comes in tonight; the Honolulu Marathon does not close its finish line until the last runner arrives. compatriots Aheza Kiros (no relation) and Woynishet Girma put in a little surge, and Galimova fell back by a few seconds into the early morning darkness (the race begins at 5:00). Galimova wasn’t sure what was wrong because the pace was so slow.”I don’t know,” she explained in English. “I don’t feel my speed.”Although the pace remained lackluster, Galimova fell farther and farther back, leaving the three Ethiopians to work together at the front. The trio hit the halfway split in 1:17:48 with Galimova 25 seconds back. The Russian would fall back even farther, but never thought about abandoning the race.”Not today,” she said. “I wanted to do better. I like this marathon very much.”Ehitu Kiros and Girma did most of the leading through 25-kilometers, with Aheza Kiros trailing them closely. In the 27th kilometer, as the race began to reverse direction to the west to finish back in Waikiki, Aheza Kiros fell behind running up a small bridge. Ehitu Kiros sized up the labouring Girma and liked her chances. She decided to wait for the long climb up Diamond Head Avenue from 38 to about 40 kilometers to strike.”I can go more time at this pace, but I didn’t know how hilly,” she said of the last section of the course. “So I decided (finally) to go.”With the sun just coming up over her left shoulder and the light reflecting off of her silver necklace, the Nike-sponsored athlete put in a surge up Diamond Head, and immediately dropped Girma. She crested the hill in sole possession of first place, and just needed to hold her pace to get the win. (c) Race Results Weekly, all rights reservedHONOLULU (11-Dec) — Gusty winds and high humidity may have slowed the finish times at the Honolulu Marathon here today, but those conditions helped spawn exciting head-to-head races for both men and women, culminating in victories for Kenyan Nicholas Chelimo and Ethiopian Woynishet Girma. Over 20,000 runners entered what was the 39th edition of America’s fifth-largest marathon.Chelimo, 28, from Ngong Hills, had the advantage of being the event’s defending champion, but he faced a quality field with a total of six men who had run sub-2:08 during their careers. His top rival was two-time Honolulu champion Patrick Ivuti, and it was not surprising that the race would come down to those two men charging to the finish line in Kapiolani Park, adjacent to famous Waikiki Beach.”It was difficult,” Chelimo said after the race. “I didn’t know (I could beat him).”Led by pacemakers Kiplimo Kimutai and Mbarak Hussein, Chelimo and Ivuti were part of a lead pack of eight at the half-way mark. Organizers had asked the pacers to run 1:05:30 through half-way, but that was impossible as the pack ran into headwinds so stiff that the palm trees along the course were leaning toward them. Besides Ivuti, Chelimo had his eye on Benjamin Kiptoo Koulum, the 2011 Paris Marathon winner and a 2:06 marathoner, and seven-time Honolulu champion Jimmy Muindi. Nicholas Manza Kamakya, who owns a 2:06:34 personal best, had already dropped out complaining of Achilles tendon pain.After the athletes completed the turnaround past 25-K and were heading back to Waikiki for the finish, both Koulum and Muindi were unable to hold the pace. That left Chelimo, Ivuti, debutant Josphat Boit and pacemaker Kimutai –who ultimately decided to finish the race– still in contention. The wind was now at their backs, and this foursome hit 30-K in 1:36:32.But as usually happens at this event, the real race lay ahead when the athletes must ascend Diamond Head Avenue for the second time. The hill starts at 38-K, then climbs 32 meters over the next 2 kilometers. With the hot sun rising over the Pacific Ocean to their left, the climb was too much for Boit and Kimutai, leaving Chelimo and Ivuti together at 40-K (2:08:24) to fight for the win. Chelimo was worried about the older and more experienced Ivuti.”In the last two kilometers –even in the last 200 meters– I thought he was coming,” Chelimo said shaking his head. “I was thinking, he is coming now.”But Ivuti, who later said he had a problem with his leg, could not respond to Chelimo’s accelerations in the finish straight. Chelimo broke the tape in 2:14:55, three seconds up on Ivuti.”This one is fantastic, and really tough: competitive,” Chelimo said of his victory and the USD 40,000 first prize.Completing their first marathons, Boit finished third in 2:15:40, and Kimutai got fourth in 2:18:12. Koulum rounded out the top-5 in 2:19:21. The women’s race played out similarly to the men’s, but with a critical difference: the defending champion and pre-race favorite Belainesh Gebre never made it to the finish line.Gebre, 24, had already run three marathons this year. Although she looked solid in the first half (1:16:16), she was dropped after 30-K, leaving a less-known Ethiopian, Woynishet Girma, a chance for victory. Girma, 25, who grew up in the village of Chancho about 40 kilometers from Addis Ababa, ran patiently behind the field and was actually 24 seconds behind the lead group of Russia’s Valentina Galimova and Svetlana Zakharova, Ethiopia’s Misiker Mekonnin Demissie, and Japan’s Eri Okubo at 30-K (1:48:14).Over the next five kilometers, Okubo and Zakharova fell back, leaving Girma, Galimova and Demissie to battle it out up Diamond Head. Girma picked up the pace, using one of the slower men to help her, and charged up the hill.”I was not scared,” Girma said through an interpreter of her push up Diamond Head. “I was doing my training on the hills, so I was really OK with that.”Girma crested the hill with only her accidental male pacer at her side, and was able to enjoy the final two kilometers to the finish line. 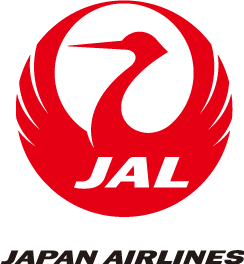 As two Japan Airlines flight attendants held the finish tape, Girma crossed herself before raising her arms in victory, breaking that tape in in 2:31:41. It was her second career marathon victory and her first in the United States.”I am happy that I won my first marathon in Honolulu,” she gushed. “I’m really happy, and I’ll come in (next year) and make it better than this.”Behind Girma, Galimova and Demissie were running shoulder to shoulder, battling for second. Demissie, who had stomach problems during the race and had even made a quick toilet stop just after the turnaround, suddenly felt a burst of energy.”(At) 20 miles I felt a little tired,” said the petite Ethiopian who lives in Albuquerque, N.M. “But after that, 200 meters (to go), I had confidence. I had a good sprint.”Galimova let Demissie go, allowing the Ethiopian to get second in 2:31:53. The 25 year-old Russian finished two seconds behind her. Kenyan Emmah Muthoni came from behind to get fourth (2:32:38), and Zakharova –who had never finished lower than second here– got fifth (2:33:17).After running, all 20,000 athletes were treated to freshly made malasadas, a sugar-dusted Portuguese pastry which are very popular here. The 1983 Boston Marathon champion Greg Meyer, who was here doing radio commentary on the race, said they were delicious and ate two. Nicholas Chelimo, 27, of Kenya, put on two surges to separate himself from the pack after the 21st mile, allowing him to distance himself from the pack en route to winning in 2 hours, 15 minutes, 18 seconds. “I am very happy,” Chelimo said.Chelimo’s first surge two minutes into the 21st mile helped him and fellow Kenyan Richard Limo pull away from a pack of four runners. Running next to each other, Chelimo put on another surge about two minutes later near Kalani High School to pull away from Limo.”The pace was a little bit fast, then slow, then fast slow, then slow. It was very strict,” Chelimo said.Chelimo opened up an eight-second lead at the 22nd mile mark, and his lead continued to grow down the stretch. Knowing that Limo was his biggest competition, Chelimo turned around to check behind him several times. Limo, 30 of Kenya, finished in 2:17:18.”I knew he would close the gap,” Chelimo said. “I know he’s very strong.”Limo said he wanted to make a move as well, but didn’t have the energy.Chelimo finished second at the October 2010 Eindhoven Marathon in 2:07:38 and was second at Honolulu in 2009 in 2:13:10. Belainesh Gebre, a 22-year-old Ethiopian who trains in New Mexico, won her marathon debut by dethroning three-time champion Svetlana Zakharova of Russia with a time of 2 hours, 32 minutes, 13 seconds.Although she was making her marathon debut, it was Gebre’s sixth professional road race win in a row in 2010 and her 13th podium finish of the year. (She also won her first race of 2011, the Naples Daily News Half-Marathon on Jan. 16). Zakharova filed a protest with the race committee after course photos indicated that Gebre’s coach and boyfriend, Ezykyas Sisay, might have paced her much of the way and further assisted her by handing her water cups. But a USA Track and Field official at the scene judged in Gebre’s favor after a review of the circumstances. “We don’t think there was any question the coach acted inappropriately,” said Jim Barahal, president of the Honolulu Marathon Association. Gebre did not contact race officials to enter the race as an elite, paid her own registration fee and wore a high rank-and-file number (9670). Gebre pulled away early in the race, and held a two-minute lead by the 10-kilometer mark.”I’m so surprised,” Gebre said of winning her marathon debut. “I’m so happy.”Zakharova gradually closed the gap on Gebre, but the 40-year-old Russian couldn’t catch up, finishing second in 2:33:01. Patrick Ivuti of Kenya pulled away from several other elite runners at the 25-kilometer mark and then held on to win his second consecutive Honolulu Marathon on Sunday. His time was two hours, 12 minutes and 14 seconds, more than a minute off the 2:11:12 record set by his brother-in-law and six-time winner Jimmy Muindi in 2004.With cool temperatures and no wind, a pack of eight set a torrid pace from the start, running sub-five-minute miles for the first 10 miles, and race officials in the pace vehicle predicted a new record. The pack had dropped to three when Ivuti made his move at the turn into Hawaii Kai round the 25-kilometer mark. But the torrid early pace took its toll on the return to the Kapiolani Park finish line. Ivuti’s pace dropped to 5:24 at the 22-mile mark, and 5:43 at mile 24, which included the Diamond Head hill. Still, his 2:12:14 finish was faster than his 2:14:35 winning time last year. Ivuti said after the race that it wasn’t his goal to set a record but just to repeat as winner. He said he was slowed by soreness in his legs in the latter part of the race. He said that after winning the Prague marathon in record time of 2:07:48 last May, winning in Honolulu capped a good year. “I’m happy; why shouldn’t I be?” he said after the race. Nicholas Chelimo of Kenya was second in 2:13:10, and Whilliam Chebon, also of Kenya, was third in 2:14:59. Muindi was fourth in 2:17:17. It was an all-Kenyan elite field. Chelimo said that around the 40-kilometer mark, he thought he might be able to catch Ivuti, but it wasn’t to be and Ivuti held on. A total of 23,248 runners registered for the race, with more than 60 percent coming from Japan. Svetlana Zakharova won her third Honolulu Marathon women’s title on Sunday, her first appearance here since winning in 2002. The 39-year-old from Russia finished in two hours, 28 minutes and 34 seconds.She was the oldest competitor in the women’s elite field. Defending champion Kiyoko Shimahara of Japan was second in 2:29:53, Pamela Chepchumba of Kenya was third in 2:32:41, followed by Kaori Yoshida of Japan in 2:35:46, and 2003 winner Eri Hayakawa in 2:44:33. Even though more than 60 percent of the field has been from Japan since the early 1990s, Hayashida and Shimahara are the only Japanese to win Honolulu titles. Zakharova, the oldest women in the elite field, said the race went as she planned. She said he wanted to run with a group of women, but at the 30-kilometer mark she felt she could go faster and broke away from the other women leaders. She said she had a minor knee problem but said “I felt confident and it didn’t cause too much trouble.” After seven years, Zakharova said she was happy to be back in Honolulu. She won her first Honolulu title in 1997 under the maiden name of Vasilieva. She also finished second in Honolulu on five occasions. Ivuti of Kenya won in 2:14:35, beating fellow Kenyan Stephen Njorge-Kinyanjui by more than three minutes.Ivuti, the 2007 Chicago Marathon winner, broke from a pack of Kenyans about halfway through the course. He is the brother-in-law of six-time Honolulu champion Jimmy Muindi who finished 5th in 2:21:43.On a day when President-elect Barack Obama’s half-sister, Maya Soetoro-Ng was an official race co-starter, Kenyans swept the top five spots in the men’s race. Shimahara became only the second Japanese citizen to win at the Honolulu Marathon in either the women’s or men’s races. She won in 2:32:36, beating her running club (Second Wind AC) teammate, Kaori Yoshida, by 2 minutes.Shimahara, bothered by an unsettled stomach, stayed with Kenya’s Alice Timbilili who ran a determined race. Timbilili gained about a 10-meter lead near the 17-mile mark but Shimahara erased it. By mile 21 Shimahara began to pull away.Eri Hayakawa was the only other Japanese citizen to win at Honolulu, clocking 2:31:56 in 2003. She finished a distant 11th this day in 3:07:39. Ambesse Tolossa of Ethiopia crossed the finish line in 2:17:26, almost a minute and a half ahead of runner-up Jimmy Muindi of Kenya.But the post-race drug test found a banned substance in Tolossa’s system and he was disqualified before summer of 2008.Muindi, who had been bothered by stomach problems in trailing Tolossa a second straight year, thus won his sixth Honolulu Marathon crown. His 2:18:53 finish was his slowest in 14 years at Honolulu.Eric Nzioki, another Kenyan, was third in 2:21:32.The 2007 race was marred by heavy rains. Biktimirova of Russia emerged from a tough battle with a Japanese runner who started out as a pace-setter and won her first marathon since 2005 in 2:33:07.She finished second in the Boston and Chicago marathons earlier in the year.Biktimirova, who averaged 5 minutes and 50 seconds a mile, shook free from Japan’s Akemi Ozaki in the 21st mile. Ozaki was designated as one of two pace-setters for the women’s race but elected to go for the win despite having only a month’s rest since completing the Tokyo Marathon. Yuji Haraguchi, 34, JAPAN, 02:33:16. Ethiopia’s Ambesse Tolossa won the most heated and most physical men’s race in the history of the Honolulu Marathon.Late in the race, Tolossa competed with five-time champion and course record holder Jimmy Muindi of Kenya like he was playing man-to-man defense in the final seconds of a close basketball game.Late in the race, Tolossa clipped Muindi’s heels and almost ran him into the path of outgoing marathoners. At one point Muindi threw a sharp elbow at Tolossa to open up space.But the Ethiopian finally surged past Muindi approaching the summit of Diamond Head Road and went on to win in 2:13:42.A frustrated and angry Muindi finished second in 2:14:39, vowing to take back his title from Tolossa in 2007. Lyubov Denisova, a 35-year-old native of Moscow who trains and lives in Gainesville, Fla., shocked the women’s field by eating up the rabbit, fellow Russian Olga Romanova, in the first two miles and running alone to a 2:27:19 course record.A two-time winner of the Los Angeles Marathon (2002, 2005) Denisova was a late entry into the elite field, having paid for her own ticket and hotel expenses. Denisova had missed the New York City Marathon in November and her agent, Andrey Baranov, said Denisova believed she could win in Honolulu. So she took the gamble as an “uninvited” runner.It paid off handsomely with a $67,000 payday, the most money ever won by a Honolulu Marathon champion. She was the first woman to win the newly established $40,000 first place prize. She also earned a $10,000 course record bonus and another $17,000 in time incentives. Jimmy Muindi of Kenya won his fifth Honolulu Marathon men’s title and third straight as he broke from the pack before the halfway point and finished in 2:12:00.Meanwhile, Russia’s Olesya Nurgalieva, an ultra-marathoner by reputation, surprised a field that included course record holder and three-time winner Lyubov Morgunova (2000, 2001, 2004) and 2003 champion Eri Hayakawa to win in 2:30:25.A faulty clock on the men’s pace vehicle and having to run without competition for the second half of the race made it difficult for Muindi to assault his 2004 course record of 2:11:12.Aother Kenyan, Mbarak Hussein, a three-time winner (1998, 2001, 2002), was a distant runner-up in 2:15:06. Nurgalieva led from start to finish and wasn’t challenged after the halfway mark. Hayakawa finished well behind in 2:32:59 and Morgunova was fifth in 2:40:47.It was Nurgalieva’s Honolulu debut. She was second in the 56-kilometer Two Oceans Marathon and 89-kilometer Comrades Marathon in South Africa earlier in the year. “It’s a huge victory for me. in her 3rd Honolulu Marathon win. Kenya’s Jimmy Muindi became the first man to win four Honolulu Marathon titles and he broke a race record that had stood since 1986.Muindi crossed the line in 2:11:12 to shatter fellow Kenyan Ibrahim Hussein’s old mark of 2:11:43.Running in a six-man pack, Muindi made his trademark surge before mile 19 and cruised to the historic win.Russia’s Lyubov Morgunova destroyed her own 2000 women’s course record by a full minute, finishing in 2:27:33.It was her third nonconsecutive win and she dethroned defending champion Eri Hayakawa.But Hayakawa, who slipped and suffered a bloody fall a few miles into the race, also eclipsed Morgunova’s old record, finishing in 2:28:11. It was a personal record for the only Japanese citizen ever to win the Honolulu Marathon in either gender division. 7th Honolulu Marathon win for South African native Schabort who was inducted into the Honolulu Marathon Hall of Fame this year. Hayakawa first Japanese runner to win Honolulu Marathon Eri Hayakawa, a student in Tokyo, became the first Japanese runner to win the Honolulu Marathon yesterday, beating Russians Alevtina Ivanova, Albina Ivanova and Olga Romanova.”From the beginning I was slow and not in good condition,” Hayakawa said. “But I turned around with the wind behind me and the Japanese runners were all cheering for me.”Among men, Kenyan Jimmy Muindi beat countryman Mbarak Hussein for his third title.Hayakawa rode the cheers of her mates to a time of 2 hours, 31 minutes and 57 seconds over the windy and hilly 26.2-mile course. Last year she finished fourth behind three Russians in her first marathon.Runners from Japan have made up more than a quarter of the field since 1985 and a study by Hawaii Pacific University estimates that last year’s race generated $81 million for the state. Yesterday Japanese runners counted for 63.8 percent of the 22,121 finishers. The total registered field was 25,283.Hayakawa disappeared into the pack from the outset of the race, trailing Albina Ivanova by 55 seconds at the halfway point. But that was in Hawaii Kai, where she turned to face the 15,148 Japanese runners trailing her and put the 25- to 30-mph tradewinds to her back.Hayakawa stayed on her pace despite trailing by so much and caught Albina Ivanova, who finished second last year after building up a similarly large lead, at the foot of Diamond Head and Alevtina Ivanova shortly thereafter. The Russians said that Hayakawa passed them so quickly that they had no hope of staying with her.”I just had to try my best, I didn’t think about winning,” Hayakawa, said. “This is all a surprise.”Jimmy Muindi earns third titleJimmy Muindi beat Mbarak Hussein, a Honolulu Marathon Hall of Famer, by 2 minutes, 2 seconds, joining Hussein and three others as three-time winners of the event.Muindi and Hussein have run the race together eight times and are as familiar with each other’s strategy as they are with their own. Muindi, who last won in 2000, usually makes his break somewhere around the 20-mile mark. But he threw a change-up at Hussein this time.”He took over with a hard surge at 18 miles and I couldn’t go with him,” said Hussein, who was running with a case of the shingles. “It kind of surprised me, usually he goes around mile 20.”Muindi said he intended to surprise Hussein with an earlier break, but not that early. He was forced into the move because Dawit Trfe pressured him a little too much. Muindi tried to escape the Ethiopian from the time the pack ran in single file into the wind on its way to Hawaii Kai.Muindi joined Hussein, Benson Masya, Duncan Macdonald and Ibrahim Hussein as three-time winners of the event. Mbarak Hussein and Muindi will return to try to break the tie next year.Krige Schabort won his sixth straight Honolulu Marathon wheelchair championship, wheeling through the course in 1 hour, 32 minutes and 52 seconds.Wakako Tsuchida made it a Japanese sweep in the three women’s races, taking the women’s wheelchair edition in 1:53:49 to finish seventh overall. Honolulu – Winning doesn’t seem to come easy for Mbarak Hussein in the Honolulu Marathon. 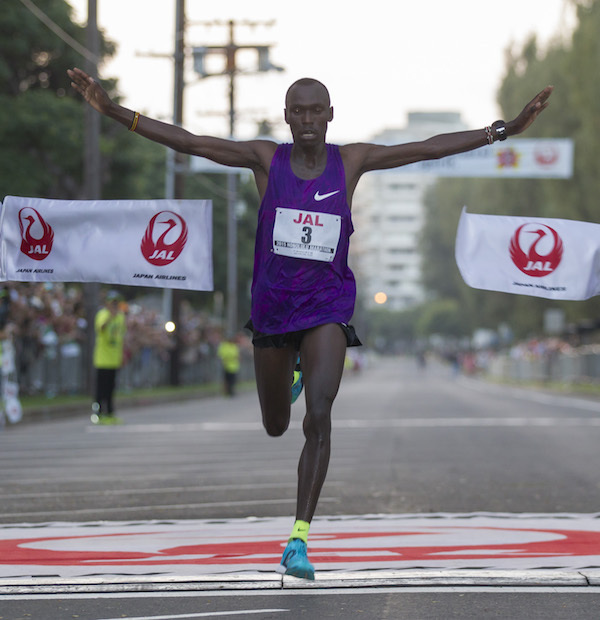 For the second time since 1998, the 37-year-old Kenyan had to out sprint a rival inside Kapiolani Park for a victory. Hussein tied his brother Ibrahim’s record of three wins here. “I called him this morning when I got back to the hotel,” said Mbarak. Ibrahim, who owns the course record of 2:11:43, won in 1985-87. Mbarak also won the Honolulu Marathon in 2001 and 1998. Hussein won just a little more than a month after his 2:09:46 victory in the Seoul International Marathon on November 3rd. 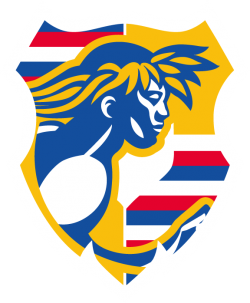 Svetlana Zakharova overtook Albina Ivanova in the last mile to lead a 1-2-3 Russian sweep and win the 30th Honolulu Marathon women’s crown in 2:29:08. It was Zakharova’s second win since 1997. Ivanova led from the 15th to the 25th mile and appeared to be in control. But Zakharova summoned something from deep inside to secure the day. Zakharova, who set the Russian national record twice this year en route to Honolulu, had finished second here five times. Ivanova had won the Dubai and the Siberian marathons this year. Alevtina Ivanova (no relation to Albina), who was the Prague International Marathon champion this year, finished third in 2:31:12. Click name to view photo, full results, and records. Hussein said of winning his 2nd Honolulu Marathon, joining brother Ibrahim as a multiple-time winner. Morgunova and Hussein win blustery marathon RussianLyubov Morgunova assumed the lead at 5 kilometers and held on against Svetlana Zakharova, also of Russia, to win her second straight Honolulu Marathon today.Morgunova clocked 2:29:54 with a pace of 5:43 per mile on rain-slicked pavement in the 76-degree heat.Meanwhile, Kenya’s Mbarak Husseinput a surge on Ethiopia’s Moges Taye in the last mile uphill on Diamond Head to dethrone two-time champion Jimmy Muindi of Kenya. Hussein finished in 2:15:09 on a mile pace of 5:09.3.Krige Schabort of Georgia captured his fourth straight men’s wheelchair title while Chantal Petitclerc of Canada won the women’s race.There were 23,513 entries, 19,499 starters and 19,236 finishers in the race. Honolulu remained the third largest marathon in the United States. For Morgunova it was not the same kind of race that propelled her to new course and race records last year.This time, the petite 30-year-old Moscovite took command and didn’t relinquish it until she’d gained a 43-second victory over Zakharova.It was the third fastest time in the history of the women’s race.Morgunova, whose margin over the auburn-haired Zakharova was only 18 seconds last year, became the first woman to ever break two-and-a-half hours on the Honolulu course twice.Zakharova, who came into the race with three of the better women’s marathon times in the world for 2001, wound up extending her record for the most runner-up finishes on the course. She now has five and won the race in 1997.Morgunova had a surprise answer when asked if she plans to return to Honolulu next year to attempt a third straight title.She said she and husband, Alexander, are planning to start a family next year, which might cause her to skip the 2002 race.Italian Franca Fiacconi, who pushed the pace last year and led much of the way, was not a factor this time as she faded to an uncharacteristically slow 2:39:32.Honolulu newcomer Elena Paramonova of Russia was third but also out of contention in 2:33:53.The men’s race was another courageous effort by the 35-year-old Hussein but it did not threaten the 15-year-old record owned by his older brother.The younger Hussein missed three-time Honolulu Marathon champion Ibrahim Hussein’s 1986 record by 3 minutes and 26 seconds. The Hussein family now owns five Honolulu Marathon titles.While Taye (2:15:29) was Mbarak Hussein’s closest rival at the end, Hussein said he had special respect for Muindi (2:15:39), who was running in his eighth race here. Race week activities included a concert by GetBack!, the original Beatles’ tribute band. Marathoners used the occasion for carbo-loading at the pre-concert, all-you-can-eat luau. Runner Peter McClellan was awarded the prestigious Race Number 2001 for posting the winning bid in a special on-line EBAY auction for charity.Benjamin J. Cayetano, the Governor of Hawaii, recognized Dr. Jim Barahal, President of the Honolulu Marathon Association, for his contributions in making the Honolulu Marathon the largest sporting event in Hawaii and one of the largest marathons in the world. Click here to view the Governor’s commendation of Dr. Barahal. As 22,903 Honolulu Marathon runners bolted in darkness to the concussion of a howitzer and the crack of aerial fireworks, Lyubov Morgunova had no idea she would earn in one morning about 20 times more than the average Russian worker makes in a year: $40,000. It was for a feat few ever thought could be accomplished in the Honolulu Marathon with its subtropic humidity, headwinds, crosswinds and Diamond Head heartbreaker. “Never in my wildest dreams did I expect this,” said race director Jon Cross after Morgunova not only smashed Carla Beurskens’ 14-year-old course record but also became the first women to ever break 2 hours and 30 minutes in a Hawaii marathon with a stunning 2:28:33 victory. For her win Morgunova received $15,000, plus $25,000 more in bonuses for setting the course record and matching various time incentives never before approached on one of the world’s more ponderous courses. “I can’t say I’m totally surprised,” said Honolulu Marathon Association president Jim Barahal, who earlier had huddled with agents and coaches for the elite women to discuss a strategy for a fast race led by a designated woman pace-setter. “With the field we had and the fact there was no wind Saturday, I said let’s shoot for 2:28:00,” Barahal said. Meanwhile, Jimmy Muindi of Kenya also collected a $15,000 first prize with his second consecutive win in the men’s race. He led the race’s 22,636 finishers in a time of 2:15:19. 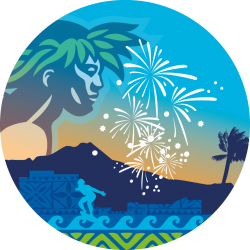 The finishing figure (of 26,465 original entries) makes Honolulu the sixth largest marathon in the world this year. “The weather was very good, no wind, just a little bit humid,” said Muindi, who was running in his eighth Honolulu Marathon. Unlike the closest men’s finishes of 1998 and 1999, Muindi dropped his nearest rival, fellow Kenyan Philip Taurus, at mile 22. The top four finishers were Kenyans, with Eliud Kering 17 seconds behind as runner-up. For the first time, microchips atached to runners’ shoe laces gave fans the chance to track the progress of competitors in the race. According to Holly Huber, co-owner and programmer for Island Infotech (the company which created and operates the Honolulu Marathon website), the new timing chips allowed marathon fans to check on the progress of any member of the field as they passed four different checkpoints: 10 kilometers, half marathon (20 kilometers), 30 kilometers and the finish. Computer users were able to access information throughout the race by typing in the name of any runner, his or her bib number, country, city or state. The 28th Annual Honolulu Marathon was held on Sunday, December 10, 2000. There were 22,636 Finishers out of 26,465 Entrants. It was the first year that a chip timing system was used in the Honolulu Marathon. The 1999 Honolulu Marathon came down to the same three Kenyan men for the second year in a row. Jimmy Muindi sprinted past 1998 champion Mbarak Hussein in the last 20 meters inside Kapiolani Park to win the first marathon of his five-year career in 2 hours, 16 minutes, 45 seconds. Irina Bogacheva of Kyrgyzstan retained her women’s title with a 2:32:36 finish, a surprisingly fast time under the circumstances. There were 21,211 official finishers. “This was such an essential win for Jimmy,” said Muindi’s manager, Zane Branson “The time was not impressive today, but people know that to win here is not easy,” he said. Erick Kimaiyo, the winner in 1996 and 1997, also bolted past Mbarak Hussein to finish second in 2:16:47, while Hussein came in third, eight seconds later. The three set a 5:13-mile pace. Greg Meyer, the 1983 Boston Marathon winner who broadcast the women’s race, said Bogacheva’s complaints seemed well-founded because not only did she lead the women almost all the way, but she could not seem to even find a man on the course who would help pace her. “She made her own race,” Meyer said. Meyer said that Russian Svetlana Zakharova, the 1997 winner, moved up to Bogacheva’s shoulder at 13 or 14 miles but the Kyrgyzstani woman gradually moved farther and farther ahead. Bogacheva had the fastest winning time here since 1993, when Beurskens clocked 2:32:20. Muindi’s 2:16:45 was the slowest winning time since 1995, when Thungwane won in 2:16:08. In the closest finish in the 26-year history of the Honolulu Marathon, Kenya’s Mbarak Hussein upset defending champion Erick Kimaiyo with a final-second spurt that could only have come from the last measure of energy and spirit in him. Twenty yards from the finish line, it appeared that Kimaiyo of Kenya would win his third consecutive Honolulu Marathon, as he had a half-stride lead on Hussein. But Hussein — the younger brother of three-time Honolulu Marathon winner and race record-holder Ibrahim Hussein — somehow surged past Kimaiyo with 10 yards remaining. “I was thinking of my brother in the last 100 meters,” said Hussein, who had never before won a marathon. In what was nearly a photo finish, both Hussein, 31, and Kimaiyo, 30, were credited with the same time — 2 hours, 14 minutes, 53 seconds. In contrast, Irina Bogacheva of Kyrgyzstan was alone as she coasted to victory, finishing 3 minutes and 17 seconds ahead of defending women’s champion Svetlana Zakharova of Russia. Bogacheva’s toughest foe was the clock; her time, 2 hours, 33 minutes, 27 seconds, was the seventh fastest time by a woman. The 37-year-old physical education teacher led Zakharova, 28, by as much as three-quarters of a mile during most of the last six miles of the race. “I kicked it in today,” said the beaming Bogacheva at the finish line. From an entry field of 27,704, a total of 22,112 runners finished, making the Honolulu Marathon the third largest marathon in the world for the second year in a row. The weather conditions were better than average with low humidty and only moderate winds. 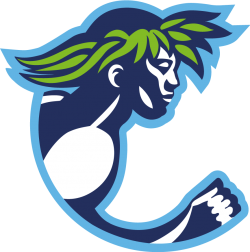 The official starter for the race, Konishiki, caused a stir among the estimated 23,000 runners lined up on Ala Moana Boulevard in the predawn darkness. The retired sumo superstar was trucked in to fire the starting gun. Konishiki’s vehicle was mobbed but race officials managed to restore order in time for the 5 a.m. start. There were 22,112 finisher out of 27,704 entrants. EXPLOSIVE described the men’s and women’s races in yesterday’s 25th Honolulu Marathon. Kenya’s 28-year-old Eric Kimaiyo capped off his brilliant year of marathoning with a surprising breakaway on the second most elevated part of the course to win for the second straight year. His time in the 26.2-mile race — 2 hours, 12 minutes and 17 seconds — on a cool 66-degree day was the fastest since 1989. It was one minute and 16 seconds faster than his 1996 time and was the fastest since the course was altered in 1992. Kimaiyo made the critical move to break away from his closest challenger, countryman Jimmy Muindi, when least expected. Approaching Mile 24 near Triangle Park, where the course rises from 10 to 100 feet above sea level at Diamond Head Lookout, he accelerated to complete the next mile in 4 minutes and 40 seconds. Muindi said he experienced stomach trouble and was unable to respond to Kimaiyo’s unusually strong uphill surge. In the women’s race, 27-year-old Russian Svetlana Vasilieva improved on last year’s runner-up performance to win at 2:33:14. Irina Bogacheva of Kyrghiztan (located between Kazakstan and northwestern China), the leader for three-quarters of the race, accused Vasilieva of getting physical with her late in the race. It was the second time in a row a Russian woman has won the race. Rumila Burangulova won last year in 2:34:28. Kimaiyo’s win was the eighth by a Kenyan man at Honolulu. Overcast skies with no winds and a sprinkle of rain in some areas — ideal conditions for a marathon — welcomed the 33,682 entrants. There were 26,495 finishers in the event, making Honolulu the third largest marathon in the world this year behind New York City and London. Sunday, December 14, 1997.Click Here to View More 1997 Photos. It was a bleak and sunless morning with winds gusting to 30 mph – a perfect day for someone to emerge from the icy Russian winter to capture and defeat the strongest field in the 24-year history of the Honolulu Marathon. It was also a day when yet another unknown Kenyan man would rise to the occasion on the course and pop a surprise finish. Ramila Burangulova, a 35-year-old mother of one who trains in the frigid shadow of the Ural Mountains, became the Honolulu Marathon’s first Russian champion, finishing in 2 hours, 34 minutes, 28 seconds. If there was any doubt that the Russian women were the hardiest and best prepared for yesterday’s chilly winter conditions, Svetlana Vasilyeva laid that question to rest when she came from behind to pull in second in the women’s field in 2:35:36. Eric Kimaiyo, a 27-year-old military enlistee, gave Kenya its seventh win in the race since 1985. Kimaiyo did it by stringing together seven straight mile splits of 4 minutes and 49 seconds or less between the 16th and the 23rd mile. His winning time was 2:13:23. Another Kenyan, Jimmy Muindi, came in 14 seconds later, following in the wake of Kimaiyo’s remarkable late-race surge. An entry field of 30,824 became a finishing field of 24,427 as Honolulu stepped down as the world’s largest marathon and took a third place position in the United States behind Boston (35,888) and New York (28,182). Four-and-a-half miles into the 23rd annual Honolulu Marathon yesterday morning, Josiah Thungwane of South Africa put on a bold – but seemingly mad and suicidal – sprint. But Thungwane wasn’t suicidal. He was just hungry. The thought of scoring his first major international victory and winning $20,000 or more had whetted the appetite of the 25-year-old coal mine worker. In 2 hours, 16 minutes, 8 seconds yesterday, Thungwane won as much money as he earns in the coal mines in about four years. But it was two-plus hours of arduous toil. Numerous times over the final four miles, the diminutive South African had to dig deep and fight off the challenges of defending champion and three-time winner Benson Masya of Kenya. As the two matched strides while leaving Diamond Head and entering Kapiolani Park, Thungwane pushed ahead slightly. It did come down to the final 200 meters … then the final 100 meters … then the final 50 meters. Thungwane dug deep, floored the accelerator, and got the jump. Masya could not respond. In fact, he slowed to a trot and crossed the finish line 11 seconds behind Thungwane. Colleen De Reuck made it a banner day for South Africa as she captured the women’s race, finishing 27th overall in 2:37:29. She was followed by Veronica Kanga of Kenya at 2:39:35. Defending champion and eight-time winner Carla Beurskens finished third, nearly five minutes behind De Reuck, ending her incredible streak of eight victories in 10 years. It was the first time Beurskens entered the Honolulu Marathon and did not win. It was the hottest Honolulu Marathon in history – a muggy 88 degrees – and the largest. More than 27,000 runners finished the race surpassing New York City as world’s largest marathon for 1995. Masya the master For the first 10 miles of the 22nd annual Honolulu Marathon yesterday morning, Benson Masya, the prerace favorite, was nowhere to be seen. He was huddled in a large pack of runners that trailed the leaders by as much as 45 seconds in the 26.2-mile run.But when Masya made his presence known and finally became a factor in the race, he did it in a big way.The 24-year-old native of Kenya took command in the 19th mile, shortly after the runners left Hawaii Kai. Masya pulled away to win by nearly two minutes in 2 hours, 15 minutes, 4 seconds; it was his third Honolulu Marathon victory.“I was never concerned,” Masya said, referring to the lead the others had built up on him. “I knew I had the speed and the endurance, and I was just waiting to get the wind behind me.”South Africa’s Thabisco Moqhali, 25, who was also part of the chase pack and who briefly took the lead before yielding to Masya, finished second in 2:16:52. England’s Andy Green, 31, was third, three seconds behind Moqhali in 2:16:55. Although it was Beurskens’ slowest finish of her eight victories, she was pleased to overcome both the windy conditions and close competitor. “I’m very happy. It was my best marathon ever,” Beurskens said. A record number of 32,804 entries yielded close to 30,000 runners lined up on Ala Moana Boulevard for the 5:30 a.m. start. Korea’s Bong Ju Lee wasn’t taking any chances with the African runners in yesterday’s 21st Honolulu Marathon. Last year, when he finished seventh here, he saw runners from Kenya, Tanzania and South Africa seize the early initiative and control the race. This time, he made his own move early. Catching up to the lead pack of Africans at mile 7, in a steady drizzle around Kapiolani Park, the 23-year-old Lee latched on and never let go. Buoyed by Korean cheering sections posted at various junctures of the 26.2-mile route, Lee won a duel with 1993 South African national champion Josiah Thungwane and held off a late surge by Boston Marathon champion Cosmos Ndeti of Kenya to win in 2 hours, 13 minutes, 16 seconds. Ndeti, who passed several runners in a furious charge over the last half of the marathon, made his second consecutive runner-up finish in Honolulu in 2:13:40. Ndeti’s 22-year-old brother, Josphat, was third in 2:13:48 in a promising marathon debut. Holland’s 41-year-old Carla Beurskens cruised to her seventh Honolulu women’s crown in 2:32:20 – the fourth fastest time in course history. Beurskens finished 11 minutes and 19 seconds ahead of second-place Amy Legacki of Michigan. Despite the rain and wind, 23,607 runners finished making Honolulu the world’s third largest marathon behind New York City and London. To hear Benson Masya tell it, he won the 20th annual Honolulu Marathon yesterday morning while running on one leg. Masya, a 22-year-old postal clerk from Kenya, certainly didn’t hop over the 26.2-mile course in 2 hours, 14 minutes, 19 seconds, a 5:07.4-per-mile pace. Carla Beurskens of the Netherlands won her sixth Honolulu Marathon in 2:32:13 while finishing 26th overall, more than six minutes ahead of runner-up Lisa Weidenbach of Gig Harbor, Wash., and seven minutes ahead of defending champion Ritva Lemettinen of Finland. Beurskens, 40, now owns the top three women’s times in Honolulu Marathon history. It was by far the largest Honolulu Marathon and one of the largest marathons in the world. The final count of entrants was 30,905 with 23,515 finishers. Yesterday’s weather was not as cool as when Hussein set the record. There was no rain and little wind. The humidity, however, slowed the pace after the first 10 miles and it soon became clear that a record was not possible. It was one of the slowest Honolulu Marathons ever run, but it also might have been the most exciting. For the first time in the 19-year history of this race, as many as five runners were in contention with less than three miles to go. With a little less than 2 miles remaining in the 26.2-mile event, Benson Masya, a 21-year-old postal clerk from Kenya, broke away from Steve Jones, a former world record holder in the marathon, and went on to break the finishing tape at Kapiolani Park in 2 hours, 18 minutes, 24 seconds. It was Masya’s first marathon. Defending champion Simon Robert Naali, 26, of Tanzania, overtook Jones with about a quarter-mile to go to finish second, 19 seconds behind Masya. Jones, 35, of Wales, was third, another two seconds back. Ritva Lemettinen of Finland, 31, was an equally surprising winner in the women’s race, finishing 30th overall in 2:40:11. Race favorite Tuija Toivenen, also of Finland, dropped out at around 10 miles. An estimated 14,000 of the 14,603 who signed up for the race lined up for the 5:30 a.m. start near Aloha Tower. It was the largest field in the history of the race. For 26 miles, it was the closest race in Honolulu Marathon history. In a sizzling sibling rivalry, 24-year-old Simon Robert Naali and his 21-year-old brother, Thomas Robert, waged a relentless duel yesterday that began at Honolulu Harbor before daybreak and endured through some of the most punishing winds the race has ever seen. Simon Robert, a police sergeant no criminal would escape from on foot, survived an intense challenge from his younger brother by surging dramatically in the last 500 yards to win the race for the second year in a row, in two hours, 17 minutes, 29 seconds. The Naali brothers, from Tanzania, finished 34 seconds apart in their third 1-2 finish of the year in an international race. Meanwhile, an unknown 24-year-old accounting firm employee from Kyoto, Masaki Oya, came in third (2:20:22) to become the first Japanese man to win prize money in the Honolulu Marathon. Holland’s Carla Beurskens became the first runner to win five Honolulu Marathons yesterday when she overcame battering winds and a surprisingly strong Japanese opponent in 2:33:34. It was the closest of all the 38-year-old Beursken’s Honolulu victories as she fended off Japan’s Misako Miyahara, 10 years her junior, by one minute and 19 seconds. The finishes by Beurskens and Miyahara (2:34:51) were the fourth and fifth fastest on record for the women’s division here. It was a wonder that the Naali brothers managed to complete their odyssey in under 2:20:00. The pair charged from an opening swarm of 13,000 starters at Aloha Tower into the teeth of a head wind that seemed to grow more vicious with every stride they took toward Waikiki. It was hard to tell the temperatures were in the low 70s. 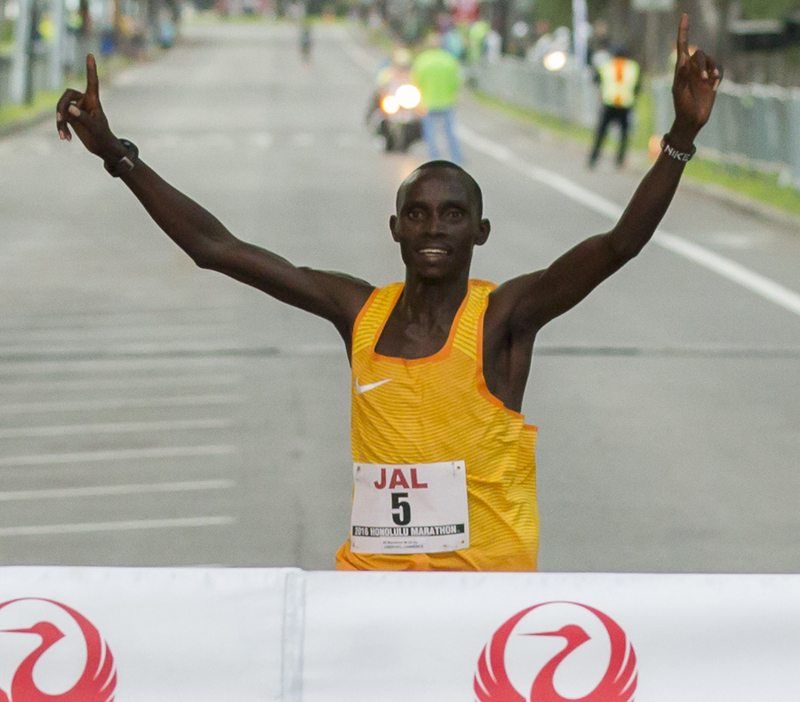 Simon Robert Naali of Tanzania won the 17th annual Honolulu Marathon yesterday by a comfortable margin. Naali, a 23-year-old policeman and father of three, broke away from Ibrahim Hussein of Kenya, three-time winner of the race, on the 12th mile of the 26.2-mile event and was never challenged after that. He crossed the finish line at Kapiolani Park in 2 hours, 11 minutes, 47 seconds, just missing Hussein’s race record of 2:11:43 set in 1986. “At that point (when Naali broke away), there was a strong head wind and I thought he was going to come back to me,” said Hussein, who held off Gidamis Shahanga, another Tanzanian, for second, 2:14:02 to 2:14:05. Two more Tanzanians, Suleiman Nyambui (fourth in 2:15:47) and Agapius Masong (fifth in 2:16:40) made it an African sweep of the five prize-money places. The women’s race was won by 37-year-old Carla Beurskens of the Netherlands in 2:31:50, less than a minute short of her race record of 2:31:01 in 1986. It was her fourth Honolulu Marathon championship, tying her with Patti Lyons Catalano for the most victories in the race. Janice Ettle of Minneapolis, Minn. took second (2:43:54), followed by Weather Tolford of Tillamook, Ore. (2:44:35). Approximately 10,000 runners began the race in front of Aloha Tower at 5:30 a.m. Although it was not as cool as it was in 1986 when Hussein set the record, the humidity did not even seem high and most runners were thankful that conditions did not resemble those of Saturday morning when heavy rains hit Oahu. You’d think Gianni Poli would have something better to do on his honeymoon than run a marathon. But Paolr, his bride of just one week, didn’t seem to mind. She jumped for joy and screamed when Poli surged ahead of Bradt Nava near the 22-mile mark to take command of the race. Poli, a 31-year-old Italian, added to his lead over the final four miles and broke the finishing tape of the 16th Honolulu Marathon yesterday morning in 2 hours, 12 minutes, 47 seconds, winning by nearly a half-mile. The victory was worth $10,000 in prize money. Nava, 22, an unexpected and unknown contender from Paraguay, clocked 2:15:12 for second place. Gidamis Shahanga of Tanzania was third (2:16:47). Three-time defending champion Ibrahim Hussein reportedly dropped out of the race at nine miles. Poli, winner of the 1986 New York City Marathon, covered the second half of the 26.2-mile event in 1:05:45, faster than his first half (1:07:02). No official records of split-times are kept, but it is believed to be the first time any Honolulu Marathon winner has run the second half faster than the first. In a somewhat ironic turn of events, Cyndie Welte of Ohio, who had come to Honolulu as a spectator, won the $10,000 first prize for women. She led the women’s field all the way, finishing 38th overall in 2:41:52. Race officials reported that entries reached the 10,000 mark on Saturday afternoon, but, allowing for the usual number of no-shows, it was estimated that around 9,000 lined up near Aloha Tower for the 5:30 a.m. start. In weather conditions that were hardly suited to running 26.2 miles, Ibrahim Hussein of Kenya won the 15th Honolulu Marathon yesterday. Hussein, 29, finished in 2 hours, 18 minutes, 26 seconds to win the event for the third year in a row. Carla Beurskens of The Netherlands won the women’s division for the third consecutive year. Beurskens, 35, finished in 2:35:11, a margin of 800 yards over Lisa Weidenbach, 26, of Redmond, Wash.
Beurskens suffered an ankle injury before the start of the race and did not threaten her 2:31:01 record of last year. 8,500 starters braved the elements in the worst conditions ever for the marathon. A winter storm brought heavy rains and strong winds gusting up to 35 to 40 mph. The wheelchair race was canceled due to flooding. Ibrahim Hussein, the defending champion, set a killer pace from the outset of yesterday’s 14th annual Honolulu Marathon and quickly buried the rest of the field. In fact, he went out so fast that even Tom Wysocki, the “rabbit,” died. Paid to set a brisk first-half pace, Wysocki of California, quit after seven miles. Hussein maintained a world record clip through the first 14 miles of the course. Hussein, a 28-year-old Kenyan, lost some of his steam toward the end of the race but still shattered the Honolulu Marathon mark of 2:12:08, which he established last year, winning in 2:11:43. Suleiman Nyambui, a Tanzanian, finished second, a full 3-1/2 minutes behind the graceful Hussein at 2:15:13. Like Hussein, Holland’s Carla Beurskens, the defending women’s titlist, also repeated winning by almost five minutes in 2:31:01. Her time easily eclipsed the Honolulu record of 2:33:24 set by Patti Catalano in 1981. Beurskens and Hussein accomplished their feats on a course that measured 130 yards too long. Presumably, the course will be shortened to a regulation 26 miles, 385 yards next year. The extra yardage added approximately 25 seconds to their times. Hussein won $10,000 for first place and another $10,000 for the record. Beurskens earned $15,000 overall. The monetary awards represented the first formal prize money in Honolulu Marathon history. In the 13 years of the Honolulu Marathon, nobody’s done it better than Ibrahim Hussein of Kenya. Hussein’s winning time of 2 hours, 12 minutes, 8 seconds, thought to be almost impossible in usually humid Hawaii, shattered the race and course records of 2:15:30 established by Dave Gordon in 1982. Hussein, 27, bettered the Hawaii standards for 15 kilometers, 10 miles, 20 kilometers, the half-marathon, and 30 kilometers en route to his victory. But they will not be officially recognized as records. Bill Reifsnyder of Pennsylvania, completing his second marathon, finished second in 2:14:39. Defending champion Jorge Gonzales was third in 2:16:24, one second better than his winning time last year. Carla Beurskens of Holland, who finished 30th overall, was the first woman finisher in 2:35:51. Honolulu’s Rachel Portner was second in 2:53:08 and Noelle Stenger, a University of Hawaii chemistry student, was third in 2:55:43. A total of 8,287 runners began the 26.2 mile race at 6 a.m. near Aloha Tower. It was relatively cool at the start, and many veteran Honolulu Marathon finishers said afterward that conditions throughout the run were the best they had experienced here. A cause for celebration and a celebration of cause . . . it was both for those who came to win and those who came just to finish yesterday’s 12th annual Honolulu Marathon. The most celebrated names, of course, belong to the winners – Jorge Gonzales of Puerto Rico and Patti Gray of California, the top male and female finishers. But there were thousands more – 8,305 to be exact – who were reveling in a victory over a windswept course, a threat of torrential rains and the aches and pains that accompany a 26.2-mile undertaking. For the 30-year-old winner Gonzales, the celebration began with 5.2 miles still to go in the race. That was when the defending Montreal marathon champ knew he had the race won with nearly a two-minute lead over Doug Kurtis and 1979 Honolulu winner Dean Matthews on the way to a 2 hour, 16 minute, 25 second finish, the third fastest in the history of the race. Gonzales, who placed 13th in the Summer Olympics marathon, hopes the victory will help establish himself as a premier marathoner in the United States. Patti Gray led the women’s portion of the race from start to finish, winning in 2 hours, 42 minutes, 50 seconds. Gusty headwinds were given as the reason that race winning Gonzales failed to break the 2:15:30 course-record set two years ago by Washington’s David Gordon. The blustery breeze was reported gusting 25 to 40 miles an hour along Kalanianaole Highway and Lunalilo Home Road. Kevin Ryan, 35, took command of the 11th annual Honolulu Marathon near the 14-mile mark yesterday, but slowed considerably over the final miles. The competition slowed even more, however, and Ryan won by more than a half-mile while recording 2 hours, 20 minutes, 18.6 seconds, the slowest winning time since the 1976 race. “I didn’t come here for a fast time,” Ryan said afterward. “I’m satisfied just to have won it.” Ryan came to Honolulu from the Boston, Mass. area where he has been employed for the last three years as manager of the New Balance Track Club. A member of New Zealand’s 1976 and 1980 Olympic teams, Ryan hopes to be selected to represent his country in the Los Angeles Olympics next year. The winning time was well off the course record of 2:15:30 set by Dave Gordon last year. Steve McCormack, a 23-year-old Californian, finished second in 2:23:09 and Graeme Holden, another New Zealander, was third in 2:25:46.6. Annick Loir-Lebreton, a 25-year-old French citizen, won the women’s race in 2:41:24.3, the slowest winning time for women since 1978. Of the 10,874 runners who had signed up for the race, 9,121 started and 8,434 finished. It definitely was not a day for records. Many of the competitors complained of slower times this year, although none seemed certain about what was responsible. The temperature, although a few degrees higher than last year, was in the usual 68- to 75-degree range for the first 2-1/2 hours of the race. The humidity might have been a little higher, but most of the runners interviewed agreed that conditions were not abnormal. Some felt that it was one of the cooler races and were happy that it did not rain as it had last year. In a “breakthrough” victory, 23-year-old David Gordon of Olympia, Wash., broke away from the world-class field to win the 10th Honolulu Marathon yesterday in a record time of two hours, 15 minutes, 29.8 seconds. The 10,258 starters and 10,043 finishers out of 12,263 entrants were all winners, too. Under conditions that ranged from clear and still to driving wind and rain, Gordon broke by one minute and four seconds the course record of 2:16:33 set by Dean Matthews in 1979. Three-time former Honolulu champion (1973, ’76, ’80) Duncan Macdonald of Palo Alto, Calif., was second in 2:17:43, followed by Swedish champion Kjell-Erik Stahl (2:17:56), 26-year-old Katsuhiro Tachikawa of Japan (2:21:35), and early leader and Olympic gold medalist Frank Shorter (2:22:16). Eilleen Claugus, 27, of Sacramento, Calif., won the women’s division in 2:41:10, more than 2-1/2 minutes ahead of 24-year-old Janice Ettle from St. Cloud, Minn. (2:43:45). Calling his record win one of many “real breakthroughs” he’s been experiencing in running, Gordon eased into the lead at 14.5 miles and never looked back. Gordon was racing in only his fourth marathon and the first since 1979, when he completed the Seattle Marathon in 2:26 under rainy, freezing (38-degree) conditions. Jon Anderson, a 32-year-old trade publication editor from Eugene, Ore., took the lead near the 15-mile mark and gradually pulled away to win the 9th annual Honolulu Marathon by a little over 200 yards. His time of 2 hours, 16 minutes, 54 seconds was one second faster the Duncan Macdonald’s winning time of last year, but fell short of Dean Matthew’s course record of 2:16:13 set in 1979. Macdonald finished second yesterday in 2:17:34, edging out Erik Stahl of Sweden, who set the pace for the first 14 miles. Anderson, a member of the 1972 Olympic team at 10,000 meters and winner of the 1978 Boston marathon, won the Antwerp (Belgium) Marathon in June. His best marathon time to date is 2:12:08 turned in at the 1980 Nike-OTC Marathon in Eugene. The women’s race went according to script as Patti Lyons Catalano won for the fourth consecutive year and for the fourth time broke the course record. Her time of 2:33:35 was nearly two minutes faster than last year and was more than six minutes faster than that recorded by runner-up Eileen Claugus. While just over 9,000 people entered the race, 7,556 lined up in front of Aloha Tower in downtown Honolulu for the 6 a.m. start. Macdonald was out of sight! Running his first marathon in 18 months and on meager training, the 31-year-old Duncan Macdonald destroyed the field. He covered the 26-mile, 385-yard course in 2 hours, 16 minutes and 55 seconds, the second fastest time ever here.In the last few miles, Macdonald was so far ahead of his pursuers they couldn’t even see him. He finished 2 minutes and 28 seconds ahead of Edson Bergara of Sao Paolo, Brazil, who was 32 seconds abeam of Rolf Salzman of Frankfurt, West Germany.Macdonald thus became the first three-time winner of the Marathon, a distinction he held for 18 minutes and 31 seconds.At 2:35:26, Patti Lyons Catalano, America’s Queen of the Road, galloped home to her third consecutive women’s trophy and her third consecutive record time. Catalano knocked 4 minutes and 41 seconds off the record she set last year, and was 4:23 ahead of Jane Wipf of Freeman, South Dakota.The race had a record field of 6,829 starters, 6,630 of whom finished. A light drizzle became a heavy, gray tropical downpour by the time the leaders hit the 10-mile mark. The runners sloshed along Kalanianaole Highway, occasionally blundering into deep water, but still keeping a strong pace.“The rain saved me,” said Macdonald, who was raised on the Big Island and went to Kailua High School here. He is finishing his residency in internal medicine in Menlo Park, Calif., which limits his training to about 70 miles a week. Many runners train twice that much. Nevertheless, Macdonald said he felt stronger than he had in eight years. Clemson grad wins the Marathon It appears that Dean Matthews didn’t get the word that you’re not supposed to take the Honolulu Marathon seriously.The 24-year-old Clemson University graduate form South Carolina shattered the course record with a time of 2 hours, 16 minutes and 12 seconds in winning the seventh annual Honolulu Marathon yesterday. He crossed the finish line at Kapiolani Park more than 500 yards ahead of runner-up Frank Shorter. Matthews overtook Ron Tabb of Texas at 14.5 miles and never was threatened thereafter. Tabb, 25, held on for third place, a few strides behind Shorter. Don Kardong, who set the old record of 2:17:04 in winning the race last year, was sixth yesterday in 2:22:23. Patti Lyons, a 26-year-old Boston resident, successfully defended her women’s title. Her time of 2:40:06 was more than three minutes better than the course record she set last year and less than two minutes short of her personal best, a 2:38:22 in Boston earlier this year. The race got under way in front of Aloha Tower in the early morning darkness. The wheel-chair participants rolled away at 5:30 a.m. and then the blast of a cannon and fireworks sent the runners off at 6 a.m. The streets were still wet from a shower earlier in the morning, but conditions were otherwise good. Patti Lyons busted across the finish line and moments later fell into the arms of her mother Freda, who swept her up with kisses, wild shouts and cheers. “I did it,” yelled the sweat-soaked, 25-year-old Massachusetts runner. Yesterday Lyons was the first woman to cross the Kapiolani Park finish line in the sixth annual Honolulu Marathon, setting a record for women at 2 hours, 43 minutes, 9 seconds – shaving 95 seconds off last year’s time. There was a field of about 1,500 women in the more than 7,000-person race. It was the second-largest marathon in history and the largest number of women ever assembled for a long-distance race. “You’ve got it,” yelled someone in the crowd as the first finisher, tall, lanky Don Kardong of Spokane, Wash., flashed across the finish line in another record-setting time. Following a personal mandate that he “never look back,” Kardong finished in two hours, 17 minutes and four seconds, a time that was a full minute ahead of Atlanta’s Benji Durden and eclipsed by 20 seconds the Honolulu Marathon record set by New Zealand’s Jack Foster in 1975. It was not surprising. If ever there was a day for breaking records, Marathon Sunday 1978 was it. The 6 a.m. start, moved back a half hour from last year, lessened the chances of heat prostration. And then the sun failed to show, kept at bay by overcast skies, while a brisk wind kicked up early on and prevailed throughout. Jeff Wells, a 23-year-old theology student from Madisonville, Tex., led a string of 2,900 runners across a Kapiolani Park finish line yesterday in the largest participation sports event in Hawaii’s history, the fifth annual Honolulu Marathon. Wells’ time for the 26-mile, 385 yard grind was 2 hours, 18 minutes and 37.1 seconds – no threat to any world or U.S. records but the second best time of the five Honolulu Marathons. Wells, who had been considered the favorite by the world-class runners in the meet, was followed in by Herman Atkins of Everett, Wash., a 28-year -old who had surprised handicappers of the race by leading it for the first 13 miles. Atkins time was 2:20:54.2. City Parks and Recreation Department worker Cindy Dalrymple was the first woman to finish, making it home in 2:48:07.6, her best marathon clocking and second women’s title. Dalrymple, a 35-year-old single parent, faced one of the stiffest tests any woman marathoner has had to measure up to, conquering a field of over 600, reportedly the largest delegation of women ever to test 26 miles and 385 yards at one time. Bruce Mitchell, one of three wheelchair entrants to the marathon, finished 103rd clocking in at 2 hours, 55 minutes and 26.3 seconds. The loudest applause of the afternoon was reserved for the youngest marathon finisher: 6-year-old Kevin Greenwell of Waialae. Men’s ChampionDuncan MacdonaldUSA (Hawaii) * 2:20:37Women’s ChampionKim MerrittUSA (Wis.) * 2:44:44 Kailua’s Duncan Macdonald, behind the leaders by as much as 200 yards at one point, overtook Jack Fultz near the 20-mile mark and stretched out his own lead to win the fourth Honolulu Marathon yesterday in 2 hours, 20 minutes and 37 seconds. Macdonald, the American record-holder in the 5,000-meters, won the first Honolulu Marathon in 1973 in 2:27 and is now the first two-time winner of the event. Jack Foster, who won the event last year while setting the course record of 2:17:24, finished eighth. Ron Wayne finished third in 2:21:26, followed by Fultz, 2:24:05; Jeff Galloway and Kenny Moore, both at 2:24:42; former Punahou school-teacher Dan Moynihan, 2:27; and Tony Sandoval at 2:28:02. Kim Merritt, 21, running in her fifth marathon, was the first woman finisher after running her fastest race yet in 2:44:44. She was followed by Australia’s Elizabeth Richards, who ran the 26-miles, 385 yards in 2:50:26 and Gayle Barron at 2:52:16. Macdonald needed only a few moments after crossing the line to recover, asking the aid station people for hot dogs and fielding questions from the media. He conceded that he had run cautiously and knew that he was off the record pace, but was satisfied with establishing a personal record for himself in the event. Over 1,600 people started the event, which began yesterday morning at 6:30 a.m. and finished among thousands of cheering spectators at Kapiolani Park. Not that the leaders were ever lacking for cheers. All along Macdonald’s return trip, he was vigorously applauded by marathoners going the other way. (excerpted from the Honolulu Advertiser, Monday, December 13, 1976)The 4th Annual Honolulu Marathon was held Sunday, December 12, 1976. Men’s ChampionJack FosterNew Zealand * 2:17:24Women’s ChampionJacqueline HansenUSA (Calif.) * 2:49:24Foster Answers Marathon Call If the hotel switchboard hadn’t remembered to give Jack Foster a wake-up call before dawn yesterday, he would have been just another New Zealand tourist sleeping in. But the switchboard operator jangled his telephone, and the mercurial Foster was thrusting through the tape of the 26-mile, 385-yard Honolulu Marathon shortly after 8:47 a.m. – in record time [2:17:24] – and ahead of 705 other finishers. “I rolled out of bed and stayed half-awake for about four miles into the race,” said the 43-year-old Foster in easy conversation moments after halting his grueling pace. Foster is used to marathons. The Rotorura, N.Z. clerk – appropriately, in a government road-building department – has been running them for seven years. He holds the world’s record for men 40 years of age and over – 2 hours and 11 minutes. Last year’s record-setting mark, turned in by Jeff Galloway of Florida, was five minutes and 38 seconds slower than Foster’s performance yesterday. Galloway, 30, placed second this year, with a time of two hours, 19 minutes and 59 seconds. In third place was Tom Howard, 27, of Richmond, British Columbia, and Honolulu’s Daniel W. Moynihan, 24, was the fourth runner to cross the finish line. Foster said it wasn’t until the 16th mile that he was able to make tracks away from his then-closest competitor, Moynihan. “That local boy – he really pushed,” Foster said. Speediest in the women’s division was Jacki Hansen, 27 of Los Angeles, Calif., world’s fastest woman marathoner, who ran the Honolulu route in two hours, 49 minutes and 24 seconds. She finished 25th over-all. Cindy Dalrymple, last year’s winner, was the second woman to finish. (excerpted from Honolulu Star-Bulletin, Monday, December 15, 1975)The 3rd Annual Honolulu Marathon was held Sunday, December 14, 1975. Shortly after 8:50 yesterday morning, Jeff Galloway – a wiry, almost fragile looking 28-year old from Tallahassee, Fla. – loped easily down the stretch of Kalakaua Avenue that runs by the Kapiolani Park bandstand, past the cheering spectators who lined the road to offer encouragement, broke through a length of string that had been extended over the pavement, and won the second annual Honolulu Marathon in record time. Two hours, 23 minutes, and two seconds earlier, Galloway – along with 314 other runners – jogging away from the starting line at the Aloha Tower and followed a tortuous course that took him past Waikiki Beach, Diamond Head and Hawaii Kai before turning back on Kalanianaole Highway and Kealaolu Avenue to finish at the park. Kenny Moore was 36 seconds behind him. Then came Duncan Macdonald–the home-town favorite and winner of the first Honolulu Marathon. And finally Frank Shorter – the Munich gold medalist who had just come from Japan where he had won the Fukuoka Marathon just over a week before. For Galloway – the sixth-ranked marathoner in the United States and a teammate of Shorter’s on the powerful Florida Track Club – the record-setting victory was expected and yet surprising. The radio reports that filtered into race headquarters in the park every five miles or so showed Galloway constantly trailing (“but only by two or three steps”) the field of Macdonald, Moore, and Shorter. And after 20 miles had elapsed he had only managed to advance to third, passing the tiring Shorter who was running with less than two weeks’ rest. Cindy Dalrymple was the 30th – and first woman to finish – while the youngest to complete the 26-mile, 385-yard run was eight-year-old John Stricklin, whose mom, Sue Stricklin, was second in the women master’s division. (excerpted from the Honolulu Star-Bulletin, Monday, December 16, 1974)The Second Annual Honolulu Marathon was held Sunday, December 15, 1974. Mens’ ChampionDuncan MacdonaldUSA (Hawaii) * 2:27:34Womens’ ChampionJune ChunUSA (Hawaii) * 3:25:31A 24-year-old University of Hawaii medical student, Duncan Macdonald, took time out from studying to win the first annual Honolulu Marathon yesterday. Macdonald was one of 167 runners – ranging from 8 to 58 years of age – who got up before dawn to compete in the grueling 26-mile, 385-yard race that will become an annual event with the hopes of someday rivaling the famed Boston Marathon. And sooner or later, 151 of them finished it. Macdonald, a former Kailua High and Stanford University distance runner, crossed the finish line in 2 hours, 27 minutes, 34.8 seconds, just breaking the State marathon record of 2:27:47 set in 1963 by Harold Cole. It was a decisive victory – runner-up Winfield Stanforth of the Army finished approximately a mile behind him in 2:34:26. A world age group record was set for 9-year-olds when Daven Chun finished the race in 3:19:01 breaking the old mark by nine minutes. Daven is one of the seven Chun members (they call themselves the “Hunky Bunch”) to start and finish the race – and all under four hours. June Chun, 14, won the women’s division and placed 47th overall at 3:25:31. As each runner crossed the finish line, the crowd responded with a round of applause. Everybody was cheered equally from winner Macdonald to 8-year-old Kris Hilbe, to the last finisher who was one of five cardiovascular patients, victims of past heart attacks who began running to build up their health and hearts. The course, meticulously measured off earlier in the week, began at the Aloha Tower, curved around Diamond Head, snaked out to Hawaii Kai as far as Lunalilo Home Road and then doubled back toward downtown with the finish line at Kalakaua and Monsarrat avenues. All the runners interviewed had nothing but praise for the organization of the race. Police escorts were around to prevent cars from hitting the runners and dogs from biting anybody. Water and sponges were available at every one of the nine comfort stations. (excerpted from the Honolulu Advertiser and Honolulu Star-Bulletin, Monday, December 17, 1973)The 1st Honolulu Marathon was held Sunday, December 16, 1973.